This classic and difficult to obtain book from Rev. Joseph Connelly was first published in 1957 and has proven to be a classic work on the Roman Liturgy. Confined to the hymns of the Roman Liturgy this book examines the liturgical hymns grouped into their liturgical seasons and provides a wealth of background and analysis on every aspect of each of the Roman Liturgy's traditional hymns. 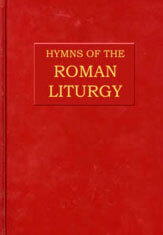 Contains Latin verses of each hymn with an English translation for 154 hymns. An invaluable resource and highly acclaimed.